The beating heart of New Orleans is her jazz scene. From the bustling live performance spots dotted throughout the French Quarter, to the numerous festivals that fill the city with parades and party-goers on a regular basis, visitors will find jazz riffs spilling out onto the streets and into their tapping toes and snapping fingers. This historic city, also known as 'The Big Easy' or simply 'NOLA', is located in the southeast of Louisiana, straddling the Mississippi River. At times in its history, New Orleans has been occupied by both the French and the Spanish, a legacy that has trickled down into the distinct Creole architecture and delectable Cajun food offered by many restaurants in the city. New Orleans' reputation as a top notch holiday destination took a strong blow from the devastating hurricanes Katrina and Rita, which swept through in 2005, flooding almost 80 percent of the city. But the people of New Orleans rallied together and the city is back to its former glory. Still, some evidence of the disaster remains, which travellers can see on one of the specifically tailored Katrina Tours which traverse the less-touristy areas of the city. NOLA is world-renowned for her hectic festival schedule, most famous of which is, of course, Mardi Gras. Other festivals, which celebrate everything from St Patrick's Day to Gay Easter, occur throughout the year. Fans of the more macabre will enjoy taking in some of the Voodoo culture of New Orleans, whether at the Voodoo Museum or on a cemetery tour. If you thought New Orleans was just about the nightlife, consider again. This is a place that offers something for everyone, all done with its very own special style and flair. Spring time, which falls between March and May, is a great time to pay a visit to The Big Easy. Temperatures are moderate, and comfortable enough to walk around in shorts and a t-shirt, and it is also one of the least humid times of year. Several festivals also fall over this period, including St Patrick's Day, The Gay Easter Parade, and the French Quarter Festival, making it a fun time to visit. Get more information on New Orleans' climate and weather. -Visit Mardi Gras World, where you can experience the most famous festival in the world year-round. -Explore the comprehensive and riveting National WWII Museum for insight into this historical event. -The New Orleans Historic Voodoo Museum is where you can learn all about the history of the 'dark arts' in the area and much more besides. -The Audubon Aquarium of the Americas is popular for its own recreation of the Gulf of Mexico. -Go for a picnic in one of the city's many beautiful parks, such as City Park or Louis Armstrong Park. -Go for a ride along the Mississippi river in a traditional steamboat. -Visit the acclaimed New Orleans Museum of Art, situated in the lovely City Park. -Go for a jaunt in the French Quarter - it's hard to top a night out on Bourbon Street. There are several options for day trips or weekend getaways just outside of New Orleans. For a taste of bayou life, one of the Jean Lafitte National Historical Park and Preserve sites is a wonderful option. If you like things spicy, you can visit the birthplace of Tabasco sauce on Avery Island. While you're there, take a peek at the swamp 'gators at Jungle Gardens wildlife refuge, or do some bird watching at Bird City. If you'd like to explore a little farther afield in Louisiana, the state capital, Baton Rouge, is located some 75 miles (121km) away. This is a great city for exploring stately historic plantation houses, and studying a slice of the country's past. Other highlights in the area include a trip to the USS Kidd at the Baton Rouge Nautical Centre, and the Louisiana Art and Science Museum. Louis Armstrong International Airport is located 11.5 miles (19km) west of central New Orleans, and is reachable by public buses, shuttles and taxis. 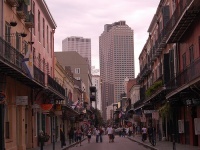 Flights to New Orleans are available from a large number of major US airports. Get more information on Airports in New Orleans. -Canal Street, just outside the French Quarter, was once the widest street in the world, named for a canal that was never built. -The total mileage of canals both above and below ground is more than that of Venice. -Poker was invented in New Orleans in the early 1800s. -Mardi Gras colours purple, green and gold were chosen in 1872 to honour Russian Grand Duke Alexis Romanoff who was visiting New Orleans. The purple signifies justice, green for faith and gold for power. New Orleans is a quirky city with a unique character quite incomparable to any other city in the US or the world. Situated on a swamp, surrounded by the sea, Lake Pontchartrain and the Mississippi River, the city chose to swim rather than sink by constructing levees, pumps and canals to protect the city. But this is an ongoing battle. Despite hit by Hurricane Katrina in August 2005, a tragedy which left 75% of the city flooded, the proud residents of New Orleans rebuilt their one-of-a-kind home with determination. And for tourists, it's once again the vibrant destination it was before the disaster. The jazz, the extravagant celebrations and the Big Easy lifestyle once again make New Orleans one of the party capitals of the US. Nightlife options are burgeoning and strains of local jazz and blues rhythms are once again echoing through the streets of the atmospheric French Quarter. Legendary Bourbon Street continues to host carnivals and parades, including the annual Mardi Gras, which has a reputation for being the most scandalous and sensational event on the world's festival calendar. Besides all the partying, New Orleans has still has serious opportunities for sightseeing. The city is full of picturesque buildings, lush parks, riverboats, vintage streetcars and museums displaying everything from voodoo culture to modern technology.